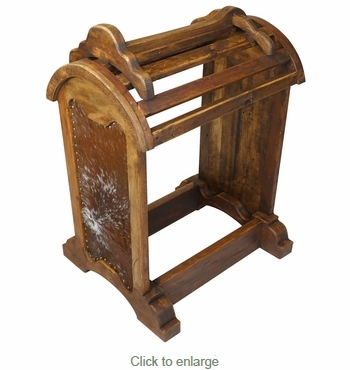 This handcrafted rustic wood saddle stand with cowhide needs your prized saddle to make it shine. The premium selected cowhide sides are edged with brass clavos to finish this beautiful and functional piece. Handcrafted by artisans in Mexico, our western cowhide furniture is perfect for southwest ranch or cabin decor. Each saddle stand is a unique creation, so expect some variations in appearance of cowhide and wood stain.